We have a lot of feelings about Normani's "Waves" music video with 6LACK, but mostly we want to know: how does she looks so good? Is it the natural glow from being a carefree and unproblematic queen? Is it Fenty Beauty's Body Lava? Drop the skincare routine, sis! But I digress. 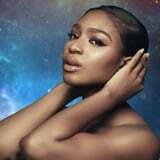 Normani dropped the official music video for her latest single, "Waves," on Feb. 12, several months after the record was dropped in November 2018. "Proud to finally share this with you guys. There was SO much love and hard work poured into this video. Hope you like it," Normani tweeted out when the video was released. "I kept y'all in mind the whole time working on this visual. I thank you for being patient with me. Y'all deserve it ✨"
The dreamy video features Normani and 6LACK as the two passionately pine for each other in a galaxy far, far away. The 22-year-old singer shows off her sultry signature moves with a group of four dancers, reminding us of how we could have had it all a few seasons of Dancing With the Stars ago. It's the first music video from Normani, and she has soundly proved that the wait is definitely worth it. We can't wait to see what else she'll be putting out there as her solo career launches!